Nope. 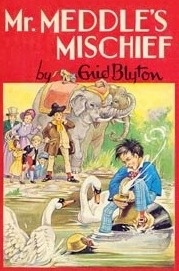 I have no idea what's happened but it looks like the elephant might have thrown the boy at the swans? If so, good on him. Or is the boy trying to hit the swans? I can't quite see it properly. Can't see what he's sitting on either. Is that a record player? This morning we read a book about the Titanic. My dad's a Titanic fanatic so Jess is too. I didn't realise there was a French guy on Titanic who had separated from his wife, kidnapped his kids and was taking them to America without her knowledge. He told everyone that his wife was dead, so when his kids were rescued and their dad presumed drowned, everyone thought they were orphans. But, despite not knowing that they'd even been on Titanic, the mum saw a photo of her poor orphaned boys and got them back. So there was a happy ending. Sort of. If you can ignore the 1500 people who drowned. "I would have gotten away with it too, if it hadn't been for those medalling brats!" Americans really have a tough time with Agricola where ploughing is essential. As I said to one in conversation: "Though it's tough to spell plough, it's rough they use plow, cough: perhaps it was a hiccough. In a drought you'd have thought there'll be no grain for dough, so you ought to have bought enough to see you through"
"and thanks for all the Ghoti"
Awful! I don't even understand all these words, jet to pronounce them in the right way. I had to double-check this when I re-discovered that this great day of boardgaming was earlier this year as it already feels like such a long time ago with all that snow, losing at almost every game, Decar conning Rich_The_Fish out of letting me win at Carcassonne, and then being made to wait for my small plate of biscuits as my blood sugar rapidly sank to new lows. Still, spending the day in the company of some great friends, and jungleboy, was very special indeed and I'm hopeful that we'll be able to repeat it all again soon. Although I might bring my own biscuits next time. I had to look up the difference between American and British biscuits to see what Dan was going on about. Apparently what we call biscuits, the Brits call scones. They are most certainly something you wouldn't bring with you nor would you look forward to them. What we call scones is well... still different. A US scone = a baked confection with some kind of filling. You wouldn't add filling like a UK scone or US biscuit. I used the ~ because the British definition of a cookie can also mean biscuit on occasion. I also learned the other day that South Africans refer to diapers as napkins and napkins as "serviettes". Good to know if I ever eat in a restaurant in Cape Town. Thanks for the insight dirk2112! Somehow I'm still just as confused as I was before, but am tolerant of both hard and soft cookies (I think), all manner of biscuits and scones as long as the jam goes on BEFORE the cream (like they're supposed to be). And nobody should start the discussion about the pronunciation of 'scones', as I've witnessed many debates regarding this here in the UK! it's scone... or the joke doesn't work. One more bizarre tidbit about biscuits. So my wife brought a cat home a few months ago. Surprisingly, I did not divorce her for that . Anyway, I came home from work on a day my wife stayed home sick. She informed me that the cat "made biscuits" on the bed to wake her up. Needless to say I was not aware of that colloquialism and thought something completely horrible had happened. I have always heard it pronounced so that it rhymes with bone, cone, or own.